The Claremont Skin, Body & Health Renewal Team took the lead in choosing the Cape Region 2014 Corporate Social Initiative. 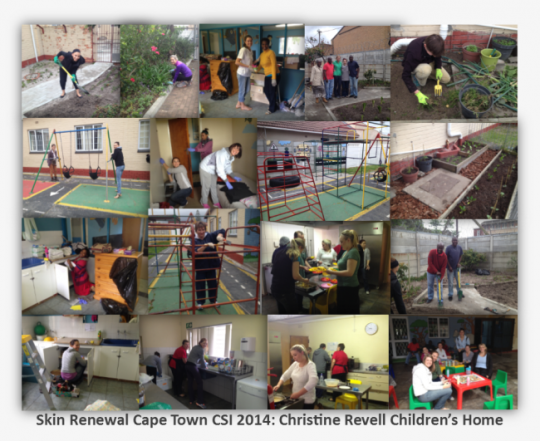 They chose to assist the non-profit organisation: Christine Revell Children's Home, based in Athlone, Cape Town. If you would like to find out more about this Home, what they do and how you can get involved, please visit their website at www.crch.co.za and contact the Director, Alicia Rhode, who will be able to assist with any of your queries. "At Christine Revell Children’s Home we provide full-time care for up to 49 babies and children from birth to five years of age who have been referred to us by social workers and placed here by order of a children’s court. The children are either neglected, abandoned, abused, orphaned and are accepted at the home irrespective of HIV status, race or gender. We strive to create a warm, friendly and homely environment, but our ultimate aim is to re-unite a child with its parents or the extended family should circumstances permit. Children are also placed into foster care with suitable families in the communities and when the proper legal channels have been followed children can also be adopted. These decisions are always taken with the full involvement of our social worker, the social worker who referred the child to us, the family and children’s courts." 1) The Cooking Team: made a wholesome breakfast for the staff, then lunch, snacks and dinner for the children: Cottage Pie & Butternut. 2) The Cleaning Team: set about to repack & deep clean general areas in addition to the children's cupboards, bathrooms and play areas. 3) The Gardening Team: did extensive weeding, pruning, and created a fresh vegetable patch. The back garden was cleaned and replanted with vibrant and colorful plants and flowers and they were able to trim the long grass by means of a donated weedeater. 4) The Children's Entertainment Team: Education Games, Jumping Castles, Face Painting and Cookie decoration activities were set-up to entertain the kids for afternoon play-time. 5) The Painting Team: set about scraping off old paint in the jungle gyms and fence. These were then repainted and paint donations left at the Home for future touch-ups. Emergency lights, and outside security lighting was installed, replaced and upgraded. Kind donations and discounts were supplied by Eagle Lighting Lakeside and Builders Warehouse Steenberg to ensure the children have ample lighting at night when regular power outages plunge the home into darkness. With the generous donations from Lamelle Laboratories and Jacques from Voltec Electrical we were able to install and get all the labor for this extensive project completed. Our contracting team donated their time and equipment to repaint the bathrooms; replace broken counter tops; and re-seal water logged areas with fresh silicon. We trust this will lengthen the lifespan of these various areas. A month's supply of good quality cleaning material, thanks to help from Sparkle Products. Various items were generously sponsored by Dischem Willowbridge ranging from nappies, baby products, a baby car seat and they have pledged an ongoing relationship with the home. Thank you so much! New Toilet seats for the kiddies toilets, and normal size seats for all the adult toilets. All the gardening requirements to improve the health of the ground, and a new hose for the garden was left in the hope that the staff can harvest some wholesome veggies to use in the kitchen. Special thanks to Ferndale Nurseries in Constantia for their contribution. Clothing, shoe & toy donations for all ages. New wheels, with break pads, for the children's cots. Discounted by Castor & Ladder in Epping. New curtains and bed sheets for the Children's cots. Towel sets in bright colors for the children and staff bathrooms. Many items on the Wish-list, including new colorful crockery & cutlery sets for the children; baby products (2 boxes of Epimax cream sponsored by Genop HealthCare, powders, clothing etc. ); cleaning products and equipment; and various electrical kitchen equipment. We trust the hard work we put in has resulted in a difference at the home and that the donations will have a lasting impact on the quality of life of the staff and children who reside at the Christine Revell Children's Home.